A long time ago in between the two great rivers Euphrates and Tigris there was a land called Mesopotamia. Above a small town and tucked into the side of the Zagros Mountains, there was an enormous stone castle with tall turrets and dark high walls. The castle was cut out of the mountain rock. The castle gates were made from the wood of the cedar tree and carved into the shapes of winged warriors. Deep inside the castle lived a cruel Assyrian king called Dehak. His armies terrorized all the people of the land. All had been well before Dehak”s rule in Mesopotamia. Previous kings had been good and kind and had encouraged the people to irrigate the land and keep their fields fertile. They ate food consisting only of bread, herbs, fruit and nuts. It was during the reign of a king called Jemshid that things started to go wrong. He thought himself above the sun gods and began to lose favour with his people. A spirit called Ahriman the Evil, seized the chance to take control. He chose Dehak to take over the throne, who then killed Jemshid and cut him in two. The evil spirit, disguised as a cook, fed Dehak with blood and the flesh of animals and one day as Dehak complimented him on his meat dishes, he thanked him and asked to kiss the king’s shoulders. As he did so there was a great flash of light and two giant black snakes appeared on either side of his shoulders. Dehak was terrified and tried everything he could to get rid of them. Ahriman the Evil disguised himself again, this time as a physician and told Dehak that he would never be able to rid himself of the snakes and that when the snakes became hungry Dehak would feel a terrible pain, which would only be alleviated when the snakes were fed with the brains of young boys and girls. So from that dark day onwards two children were chosen from the towns and villages that lay below the castle. They were killed and their brains were taken to the castle gates and placed into a large wooden bucket made from the wood of a walnut tree and held firmly together by three thin bands of gold. The bucket of brains was then lifted by two strong guards and taken to the wicked Dehak and the brains fed to the hungry snakes. Since the snake king began his rule over the kingdom, the sun refused to shine. The farmer’s crops, trees and flowers withered. The giant watermelons that had grown there for centuries rotted. The peacocks and partridges that used to strut around the giant pomegranate trees had left. Even the eagles that had flown high in the mountain winds had gone. Now all was dark, cold and bleak. The people all over the land were very sad. Everyone became terrified of Dehak. They sang sad and sorrowful laments that expressed their pain and plight. And the haunting sound of a long wooden flute could always be heard echoing throughout the valleys. Now there lived below the king’s castle a blacksmith who made iron shoes for the famous wild horses of Mesopotamia and pots and pans for the people of the town. His name was Kawa. He and his wife were weakened by grief and hated Dehak as he had already taken 16 of their 17 children. Every day, sweating hot from the oven, Kawa banged his hammer on the anvil and dreamed of getting rid of the evil king. And as he banged the red hot metal, harder and harder, the red and yellow sparks flew up into the dark sky like fireworks and could be seen for miles around. One day the order came from the castle that Kawa’s last daughter was to be killed and her brain was to be brought to the castle gate the very next day. Kawa lay all night on the roof of his house, under the bright stars and rays of the shining full moon thinking how to save his last daughter from Dehak’s snakes. As a shooting star curved through the night sky he had an idea. The next morning he rode on the bare back of his horse, slowly pulling the heavy iron cart with two metal buckets rattling on the back. The cart climbed up the steep cobbled road and arrived outside the castle. He nervously emptied the contents of the metal buckets into the large wooden bucket outside the enormous castle gates. As he turned to leave he heard the gates unbolt, shudder and slowly started to creak open. The watermelons began to grow, as they had for centuries before. The eagles returned and flew on the warm winds amongst the mountain peaks. The peacocks fanned their beautiful plumes that glinted in the hot spring sun. Wild horses with long black manes galloped over the dusty flat plains. Partridges perched and sang on the branches of the pear trees. Small children ate ripe walnuts wrapped in fresh figs and the smell of freshly baked bread from the stone ovens reached their noses with the help of a light breeze. The fires burned higher and higher and the people sang and danced around in circles holding hands with their shoulders bobbing up and down in rhythm with the flute and drum. The women in bright coloured sequined dresses sang love songs and the men replied as they all moved around the flames as one. Some of the youngsters hovered over the flute, drunk with the sound of the music, their arms outstretched like eagles soaring the skies. Now they were free. To this day, on the same Spring day every year, March 21st, (which is also Spring Equinox) Kurdish, Persian, Afghan and other people of the Middle East dance and leap through fires to remember Kawa and how he freed his people from tyranny and oppression and to celebrate the coming of the New Year. 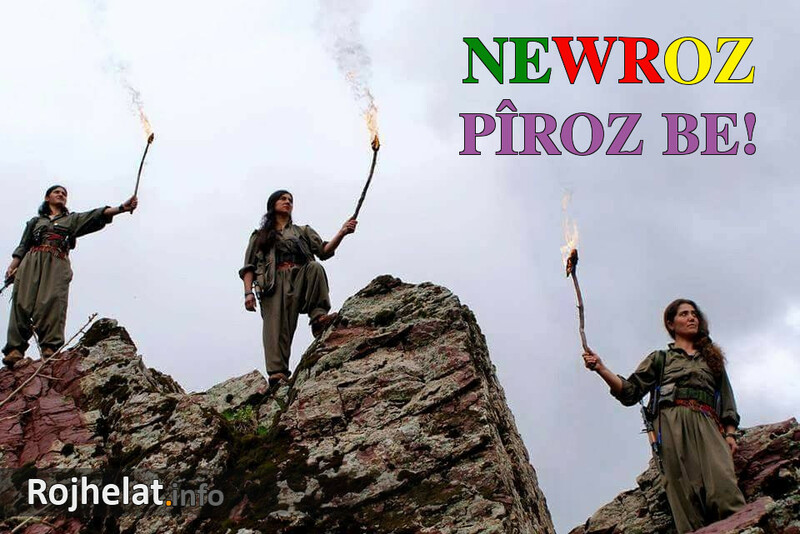 This day is called Newroz or New Day. It is one of the few ‘peoples celebrations’ that has survived and predates all the major religious festivals. Although celebrated by others, it is especially important for the Kurds as it is also the start of the Kurdish calendar and celebrates the Kurds own long struggle for freedom.